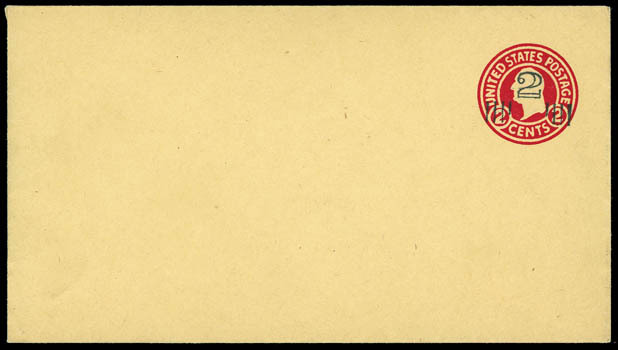 Envelope, 1884, 2¢ brown on blue, used cut square, 34 x 36mm, rich color on crisp paper, neat strike of Lebanon Pa. Patent cancel showing part of cds, clear part of papermaker's watermark, Extremely Fine and choice, ex-Wanamaker; signed by Champagne. 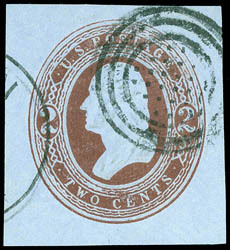 ONE OF FINEST EXAMPLES OF THE EXCEEDINGLY RARE 2¢ BROWN ON BLUE WITH ROUND "O" IN "TWO", ALL OF WHICH ARE KNOWN USED. According to Porter Venn, there is only one used entire and seven cut squares known. A number of the cut squares originate from Lebanon, Penn. and cancelled by the three-ring patent cancellation. 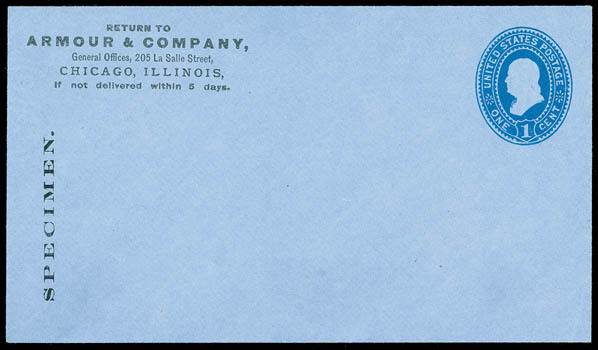 Envelope, 1887, 1¢ blue on blue, entire with printed Armour & Company of Chicago return address, size 8, knife 38, watermark 12, brilliant color on deeply blue paper, ex-F.P. Brown, "Wanamaker". UPSS No. 893 $27,500. Scott No. U299 $30,000 as mint entire. ONE OF THE RAREST ENTIRES WITH ONLY TWO KNOWN, THIS BEING THE ONLY EXAMPLE WITH THE "SPECIMEN" OVERPRINT- ONE OF THE KEYS TO A COMPLETE COLLECTION. Porter Venn records one unused entire, one full corner and two cut squares, as well as the entire with "Specimen" overprint offered here.